Drum Corps International had a visit Friday, April 26 at its Indianapolis headquarters from Taylor Swift drummer Matt Billingslea and drum tech Mark Arnold. The two were in town for the country music superstar's "The Red Tour" which is coming to Bankers Life Fieldhouse in Downtown Indy. 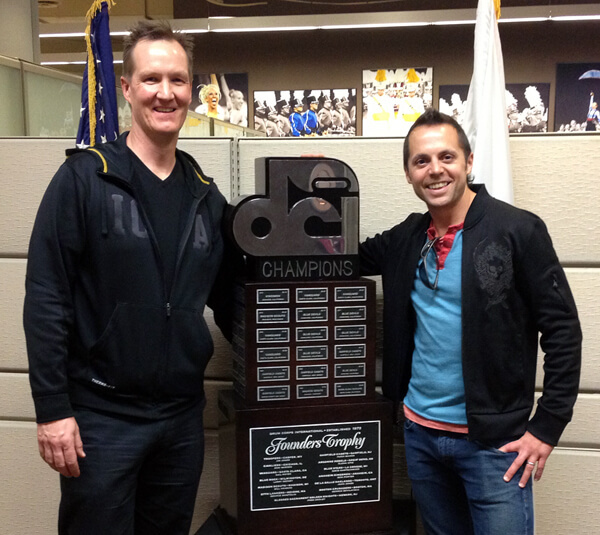 Taylor Swift drummer Matt Billingslea (R) and drum tech Mark Arnold pose with the DCI Founders Trophy. Arnold, who was a member of the Emerald Knights Drum and Bugle Corps of Cedar Rapids, Iowa in the 1980s, was featured in a 2009 issue of Drum Corps International Magazine, then working as a drum tech for Chris McHugh in country star Keith Urban's band. "I love what I do now," Arnold told DCI Magazine. "I love the road, [getting] to see the country, Europe, Australia. If I can keep doing the live drum tech thing for a really long time, I'd love to." But if he had the time, he said, he would also love to march again. "I miss playing in a bass drum line."